This overview will provide a short explanation of the various anodizing processes used in the aerospace industry today. Many electrolytes have been tested, used and patented during the last century, leaving only a few as important industrial processes. According to the “bible” of anodizing, “The Surface Treatment and Finishing of Aluminum and its Alloys” by Wernick, Pinner and Sheasby, the three most important ones are chromic acid, sulfuric acid or oxalic acid.1 Acids as phosphoric acid and boric sulfuric acid mix are now used in the market for anodizing in the aerospace industry. Chromic acid anodizing, or CAA, was the first commercial anodizing process patented in 1923 by Bengough and Stuart, followed closely by the first sulfuric acid anodizing (SAA) process patented in 1927. The oxalic acid was introduced by the Japanese in the middle of the 1950’s. 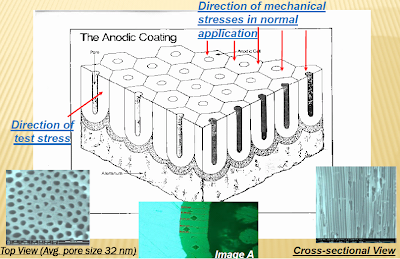 The main interest today is as an additional acid in hard coat anodizing, or HCA, to produce a harder coating faster than that obtained with a pure sulfuric acid electrolyte. Phosphoric acid anodizing, or PAA, and boric sulfuric acid anodizing, BSAA, were both developed by the Boeing Company, the first one as a structural bonding surface and the other as a replacement for CAA for non-critical fatigue parts. The most commonly used anodizing process is the sulfuric acid anodizing process, but for the aerospace applications this picture looks a little different. Chromic acid anodizing is mostly used for protection of critical structures with all kinds of joints. The corrosion resistance is excellent relative to the thickness of the coating, which normally lies in the range of 0.08 – 0.2 mil. The oxide film is softer and less porous than those formed by the other processes, and is formed without any significant fatigue loss of the material. The film is easily damaged, and the color is light opaque gray. When this film is sealed in a dichromate seal, a greenish color appears. The process is voltage controlled with a ramping in the beginning of the process increasing up to 40 volts depending on the type specified. Two types are specified in the military specification MIL-A-8625F, type I and Type IB, whereas the first is conventional coatings produced by a voltage of around 40 volts and Type IB uses a voltage of 20 to 22 volts. Sulfuric acid anodizing can be divided into two main uses, for Type II coatings and Type III coatings. Type II is primarily used for decorative or protective applications, whereas hard coat oxide films, Type III, are used for engineering applications, i.e., the aerospace industry. MIL-A-8625F specifies the Type III coatings as those formed by treating aluminum and its alloys electrolytically to produce a uniform anodic coating. This gives a variety in the process operations procedures as long as a heavy, dense coating is produced. Phosphoric acid anodizing is basically used for structural adhesive bonding in high-humidity environments. This process is known as the Boeing Process and is carried out at 10-15 V. The formed oxide film has a greater durability under adverse conditions than film formed in chromic acid and sulfuric acid. One of the reasons for the great adhesive property is said to be due to the morphology of the oxide film, which should be a film of pores with whiskers or protrusions on the top surface of the formed film. The last anodizing process mentioned is the new boric sulfuric acid. This is an alternative to the chromic acid electrolyte, which contains hexavalent chromium. Note: Hexavalent chromium is carcinogen and has to be phased out of metal finishing processes. Therefore, hexavalent chrome-free electrolytes are necessary. The formed oxide film from the boric sulfuric electrolyte has a paint adhesion that is equal, or superior, to the one formed on chromic acid. The process is voltage controlled and is ramped to 15 V. A seal in a hot dilute chromate solution is required to achieve satisfactory corrosion resistance. The above processes are the basis of the anodizing we do in the aerospace industry today. It should be remembered that operating conditions might vary within a wide range, and that most of the specifications are general guidelines. Therefore, the most important part to remember is to define the performance criteria before choosing the right anodizing process. Wernick, S., Pinner, R. and Sheasby, P.G., “The Surface Treatment and Finishing of Aluminum and its Alloys”, 5. Ed., Finishing Publications LTD., Teddington, Middlesex, England, 1987. Juhl, A. Deacon, “Hard Anodizing of Aerospace Aluminum Alloys”, Light Metal Age, June 2009. Lerner, L., Sanford Process Corporation, “Hard Anodizing of Aerospace Aluminum Alloy”, presented at IMFAIR09, 10-11 June, 2009, Royal Air Force Museum, Cosford, Shropshire UK. Schaedel, F., “Improving Anodize Wear and Corrosion Resistance by Combining Modified Electrolyte Chemistry with Advanced Waveform Pulse Ramp Technology”, AAC 17th Anodizing Conference & Exposition, October 28–30, 2008, San Francisco. Juhl, A. Deacon, “Pulse Anodizing of Extruded and Cast Aluminium Alloys”, Ph.D. thesis, Inst. of Manufacturing Engineering, The Technical University of Denmark, July, 1999. Juhl, A. Deacon, “Why it Makes Sense to Upgrade to Pulse Anodizing”, Metal Finishing, July/August 2009. Last week the 7th Aluminium Two Thousand International Congress took place in Bologna, Italy. Around 350 people attended from 25 different countries. With the motto “Let´s build the future of the aluminum world together” the days were fully packed with experts from all around the world. The three day program with parallel sessions included analysis of the aluminum industry, interesting new developments within all different aspects of the aluminum industry; foundry, casting, extrusion, anodizing and painting, automation, architecture, transport industry, environmental protection and recycling, measuring, testing and quality techniques. A lot of the presentations were about how to save money, which is probably understandable because this is a topic we all can relate to and want to hear more about. So I was very honored to be asked to present a paper on the cost savings when changing from conventional DC anodizing to Pulse anodizing. The paper and presentation showed that the ROI is less than a year for an Anodizing line to switch from conventional DC to Pulse anodizing – all because of the increase in productivity. I am proud to say that the paper, among three others, was awarded “Most interesting presentation”, at the congress. First a short introduction to friction and the friction coefficient. Friction is the force resisting when two parts are moved against each other. This can be between solid surfaces, fluid layers and/or material elements. The subject here is between two solid surfaces, also called dry sliding friction, no fluid in the sliding area. The coefficient of friction is defined by the applied load between two parts, L, and the resultant friction force required to slide the two parts, F.
µ=F/L (the value is dimensionless). The dry sliding friction coefficients vary a lot depending on the surfaces characteristic of the two parts. It is important to mentioned here that all friction coefficient values should be treated with caution because the value is very dependable of the environment and operating conditions. The following table is taken from SIS Handbook, Aluminium, ed. 3, June 2003 and edited by me. The aluminum alloy used is not mentioned. The value of the friction coefficient has to be dependent on the uniformity and quality of the anodic layer formed. So therefore the value would be dependent of the aluminum alloy used because of the difference in quality of the anodic layer. For any specific application the ideal method of determining the coefficient of friction is by trials. As mentioned above sometimes there is a fluid layer involved which will immediately change the picture. This figure is taken from The English Surface Finishing Company, Poeton. So what I am saying is, take a careful look at your environment, if you are out of the pH range 4.5 – 8.5 you should immediately be aware of a possible corrosion issue. This is the same whether you have an anodized surface or not. The protective oxide film will not be protective anymore, leaving a part smaller or bigger part of the aluminum unprotected. An e-mail and one hour, and $495. Money you’ve earned into multiples when you can reduce your time used on this specific issue, and know what to expect of your product and what your requirements are.